HMS Acasta: To be or not to be a bum boat girl? Just what options do women have in the world of sailor (British Navy) reenacting? Believe it or not, there really were women’s roles with the Navy. Which means there are great opportunities for women interpreters attached to the Acastas. The most obvious and common choice is to portray an officer’s wife, waiting about for the occasional shore visit from the husband. This works well for those who like to promenade and tiptoe fancifully, hosting teas and fine dinners and all-the-while being the picture of fashion. But we must keep in mind that it wasn’t all silk and wine for sailor’s wives! It wasn’t easy being married to a sailor. Well-to-do wives were left behind for months and even years at a time. They were expected to run the estate or household and raise the children alone. From a letter (dated June 9, 1755) to her husband, Admiral Boscawen, Fanny Boscawen describes being busy from 6:30 AM until 11:00 PM, dealing with the running of their country estate and the raising of their five children. The tasks she described included feeding the chickens, consulting with her housekeeper concerning menus and other household affairs, working with the estate manager concerning livestock and farming, walking to the village, eating meals, writing letters, and working in the dressing room with the children while another read aloud until the girls’ bedtime, then consulting with the housekeeper again before going to bed at 11:00 PM. But we can’t all be officers wives, can we? Certainly, we could take on the task of interpreting what it was like to be the wife of an ordinary seamen. In records of the day, we see glimpses of the hardships they endured as they attempted to survive without their husbands for long periods of time. Wives of sailors did not receive regular income from their husbands, as sailors were only paid very infrequently, when the ships commission ended. Is was common for wives to go from between 6 months to three years without receiving any of their husbands’ pay. For example, in 1821, the local churchwardens of Portsmouth, England appealed to the Admiralty for financial assistance to help support all the Sailors wives and families. It was also common knowledge of the time that, if a sailor’s wife wanted to be sure to get her share of her husband’s wages; she must be on hand when the ship docked and the dockyard commissioner and his clerks came out to pay the sailors in cash. There is no doubt that sailor’s wives did what it took to survive, knowing that they might be months or even years without seeing a penny in Navy wages. In addition to raising their large families, these women took in lodgers and laundry, went into domestic service, and even ran taverns or lodging houses. Some women, in dire straits, even became thieves. We know from courth records, that Mary Dutton, a widow of a sailor, was hanged at Tyburn on January 13, 1742, for stealing a watch in Piccadilly and Elizabeth Fox, one of London’s notorious pickpockets, was hanged in 1741. If you’d prefer not to be left behind, you might transform yourself into a man with yards of tape, glue, and cloth. Woe betides those of us with ample bosoms and womanly curves! It's a hard thing to pull off, even for the pencil bodied women. There are, in fact, a few who manage it today, just as a few women did in the 1700’s and 1800’s. A case in point is the tale of Elizabeth Bowden, a fourteen-year old girl who was listed on the books of the HMS Hazard as a boy of the third class. Elizabeth managed to stay disguised as a boy for nearly six weeks before her shipmates discovered her. Upon this discovery, the captain of the ship gave her separate living quarters and allowed her to stay onboard ship, serving as an attendant to the officers. In the 1740’s, Hannah Snell served in the army and navy as a man for four and a half years before she revealed that she was a woman. For the brazen and bold, one could always portray the seedy side of life aboard ship as a visiting prostitute, or bum boat girl. 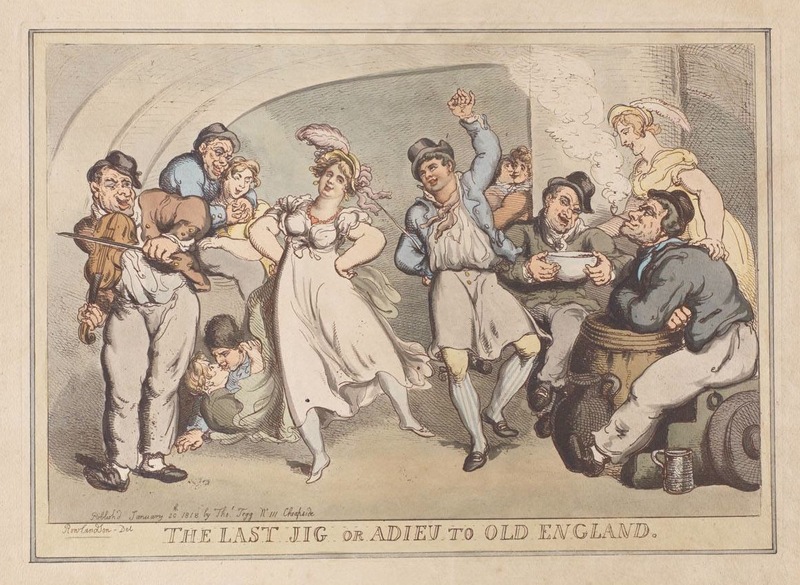 When ships came to port and sailors had no right to shore leave, it was a common practice for sailors’ wives and prostitutes to be ferried out to the ship. As a nod to naval regulations, prostitutes selected by the sailors were signed on as their wives and were allowed to live onboard ship while she was in harbor. They drank, danced and shared the sailor’s hammocks until time for the ship to leave harbor. Unfortunately, they often left their sailor men a parting gift of venereal disease that the ship’s doctor would have to treat. For sailors lucky enough to be granted shore leave, the lower sort of prostitutes were to be found in taverns and alleys. These women were very often crass, uncouth, and dishonest. A somewhat better class of strumpet lived in Albert Square and Seven Star Alley and often described themselves as a wife to a visiting sailor. There is an account of a German women who told an interviewer that she was currently living with an English sailor whose ship was in the docks, saying that she had known him for almost two years and that he always lived with her when he came ashore. She continued by saying that she took all his money when he landed, spent half of it while they were together, and kept them remainder when it was time for him to go back aboard ship. It was not uncommon for these prostitutes to have anywhere from four to ten regular sailor husbands who would seek them out when they came ashore. For the more discerning sailor and officer, the Harris’ List or the Covent Garden Magazine were the places to find a classier sort of whore. These lists often described the women of London’s pleasure gardens and their prowess in nautical terms and the officers consulted them as they would a bawdy catalogue. But if being a man or a bum boat girl isn't quite the right fit, you might choose to portray a standing officer’s wife, living on board the ship with her husband. It was usually the wives of warrant officers such as the gunner, boatswain, and the carpenter, who were permitted to go to sea. These standing officers received their warrants from the Navy Board and were attached to the same ship from the time she was built to the day she was broken up. Quite often, these warrant officers were more reliable, older men and their wives, therefore, viewed as more respectable. Wives of warrant officers lived in a cabin on board ship with their husbands and often acted as surrogate mothers to the young boys in the crew. There are also mention of them helping to tend to the wounded and assist with powder during battle. Women of the lower deck did not officially exist, though we see glimpses of them is records of the ship’s doctor or private journals. In fact, in 1806, the Navy regulations revised by Lord Barham stressed that captains were not to allow women to sail onboard ship without orders from his superior officer or the Lords Commissioners of the Admiralty. Yet John Nicol, a seaman on board HMS Goliath during the Battle of the Nile (1798), mentioned women carrying powder to the guns, providing water and wine to the soldiers during the battle, and tending to the wounded. He goes on to mention that one woman died during the battle and another gave birth during the chaos. The presence of women onboard ship is also documented in various court marshals. The court-martial record (March 15, 1799) of five members of the crew of the HMS Hermione accused of mutiny details the capture, escape, and eventual pension application of Mrs. Martin, widow of William Martin, who acted as Boatswain during the mutiny attempt. Well, girls, if none of this strikes your fancy . . . just consider, even the 19th century was a material world. So grab your reticule and your seaman’s pay, and go shopping, you material girl! Cordingly, David. Women Sailors & Sailors’ Women: an untold maritime story. Random House, 2001. Druett, Joan. Hen Frigates: Passion and Peril, Nineteenth-Century Women at Sea. Simon and Schuster, 1998. Rees, Sian. The Floating Brothel: The Extraordinary True Story of an Eighteenth-Century Ship and Its Cargo of Female Convicts. Hyperion, 2002.